Home » Publications » Section III » 6: Have you changed your mind? 6: Have you changed your mind? Photo courtesy of NIDA. If You Change Your Mind. Student magazine. NIH Publication No. 93-3474, 1993. Here is our last image. As we look at side-by-side PET scans of a person who has never used cocaine compared with a cocaine addict, can you tell which brain is more active and healthy? Take a guess. Yes, the brain on the left with an abundance of red is the healthy, active brain. With a little bit of knowledge about what drug addiction actually is, anyone - not just neuroscientists and neurobiologists - can see the changes in brain activity caused by drug abuse and addiction. The PET scans we’ve looked at today prove that. We’ve seen the scientific facts. We’ve learned that addiction is a brain disease. And we’ve also learned that scientists are making great strides in developing treatments for addiction. There will be no magic charm to make addiction go away. But educated and informed with the scientific facts about what drugs can do to the brain, we are each in a better position to decide whether or not to take drugs in the first place. Given the facts, have you changed your mind? 4: Is it worth the risk? NIDA. "Bringing the Power of Science to Bear on Drug Abuse and Addiction." National Institute on Drug Abuse, 5 Jan. 2007, https://www.drugabuse.gov/bringing-power-science-to-bear-drug-abuse-addiction. NIDA. Bringing the Power of Science to Bear on Drug Abuse and Addiction. National Institute on Drug Abuse website. 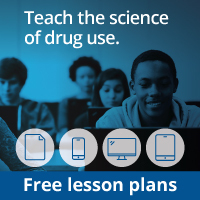 https://www.drugabuse.gov/bringing-power-science-to-bear-drug-abuse-addiction. January 5, 2007.